The first phase of the $6 million makeover of the Mount Gilead State Park has been completed. Priliminary rennovation of the park included placing 22 new full-size concrete pads throughout camping areas. These pads have been placed in the section that covers the 5-26 camping sites, all full-service with water, sewer and electric. There are 59 camping sites and two camper cabins in the park. Lora Weiser, park manager, said a new sand colored shower house was also constructed and its amenities include four showers, three individuals and one family and a laundry facility. There are also men’s and women’s bathrooms with three stalls each and all-flush toilets. Ronald and Betty Kunze, of Sun City Center, Florida, former Morrow County residents, moved to Florida in 1973 where they worked until they retired. The couple was camping in their full size RV on one of the new full size pads. “This pad is really nice,” said Ronald, noting it was much easier to park the RV. They were adjacent to the new bath house which they also compliment- ed. “It’s much more convenient to do laundry,” said Betty. The Kunzes have been camping since 1998 and return to Morrow County to camp each year. Upgrading of the camp sites will continue in the fall, which will include placing concrete pads on the remaining electric only sites. Part of the park’s improvements will include the new playground across from shelter house two at a cost of $50,000. Weiser said that beginning in the middle of July or the first of August the next phase of the $6 million upgrading will begin when the two dams will undergo major changes. There will be a new dam at the lower dam site and the upper dam will get a spillway. These projects are made possible through funding from the Ohio State Parks Capital Improvement Fund to the Ohio Department of Natural Resources (ODNR) Through the support of Governor John Kasich, Senate President Keith Faber and the Ohio General Assembly, the Ohio State Parks received $88.5 million for capital improvements to strengthen the infrastructure and modernize facilities. The announcement from the ODNR noted Ohio is one of only seven states in the United States where admission to the state parks is free. 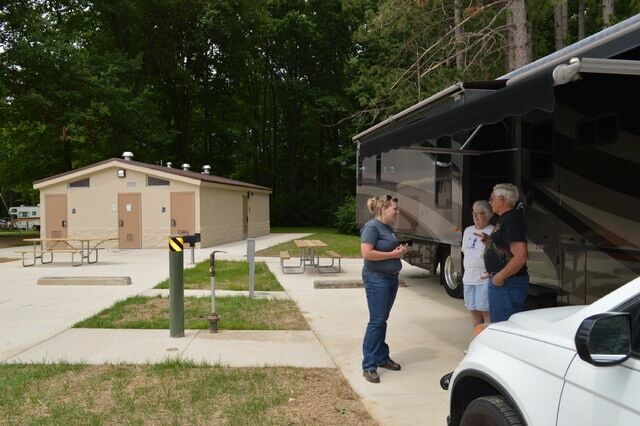 Lora Weiser, Mount Gilead State Park manager, speaks with Ronald and Betty Kunze, right, as they stand alongside their RV parked on one of the new concrete pads in the State Park camping area. To the left is the new Bath/Shower house, which also contains a laundry area.